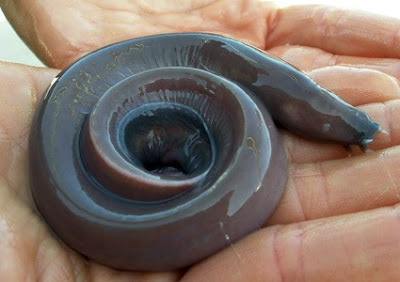 Moneca reminded me of the hagfish, (aka slime eel), and it's high-time I posted on it again. This moderate-sized monster (ranging from a foot and a half to almost a meter) is famous for two things: its feeding habits and its slime. They aren't rightly called fish, since they have no vertebrae. They have no bones at all, and are more closely related to lampreys, which should give you some insight into their character. First the slime: they produce it from glads embedded in their skin, and can fill a milk jug with it in a single sitting. They produce it to ward off predators or to encase themselves if needed. It's so viscous and fibrous that it can suffocate would-be predators by coating their gills. And how does the hagfish rid itself of its own slime? It can tie itself into a knot and slide the knot down its body. That's a trick my son once tried, to escape a particularly inconvenient diaper change. As for feeding, well, it's the stuff of nightmares. They swim up behind unsuspecting fish, latch on to the fish's skin with their barbs, then proceed to burrow their way in. Once safely ensconced inside the fish, they begin eating from the inside out. Not a pleasant way to go. But honestly, if it were socially acceptable, this is almost exactly how I'd eat my pizza. They were featured on Dirty Jobs once, and that was honestly the first episode that nearly made me lose my lunch. I think that its useful to clarify that hagfish feed on moribund or dead fish. The feeding mode you describe sounds more like that of its cousin, the lamprey. 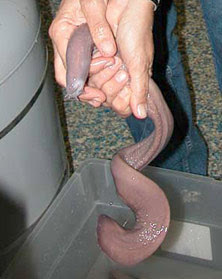 Hagfish don't actually attack living, healthy fish, as far as I know. GROSS. On so many levels, gross.